Sure everyone will remember Eye Of The Tiger but hey there are lots of good songs put together just for you an your date on your first appointment. Gosh this cd in a car with bright sunglasses and a mate and the world looks great. OK you drive her home and have to take care of your grandma's little cat so you can prepare some candles. Don't be messy, be gentle and polite and put this damm cd in the cd player, just push play!!!!!!!!!!!!! 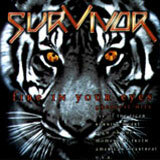 Survivor; the band's name says it all. It is the band of one huge hit Eye Of The Tiger taken from the movie Rocky (I don't remember if it was Rocky 120 or Rocky 421 ; ). So the cd starts with this song so you'll be successful with the people around you. There are a bunch of great AOR songs and catchy ballads. At least this greatest hits is a real one with THE best songs of Survivor and the production is worth it. Because there is another best of which went out a few years ago and it is a shity one, watch out because the cover is very similar to this one. So be sure you buy this one, just watch for the year 2001 on the back of it.